Glasgow, Castlemilk House. 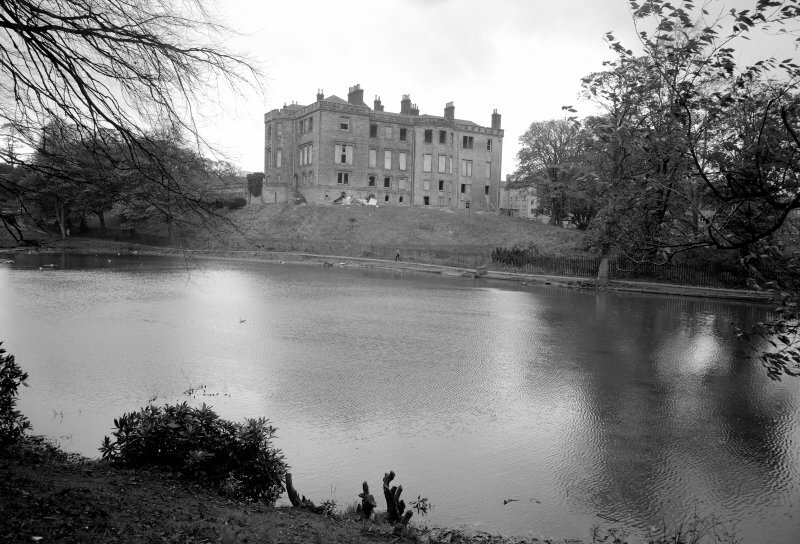 View from East of house in derelict state with lake in foreground. Glasgow, Castlemilk House, Fragment of painted ceiling. View of fragment of painted ceiling from first floor, South-West apartment, South block. Glasgow, Castlemilk House, interior. 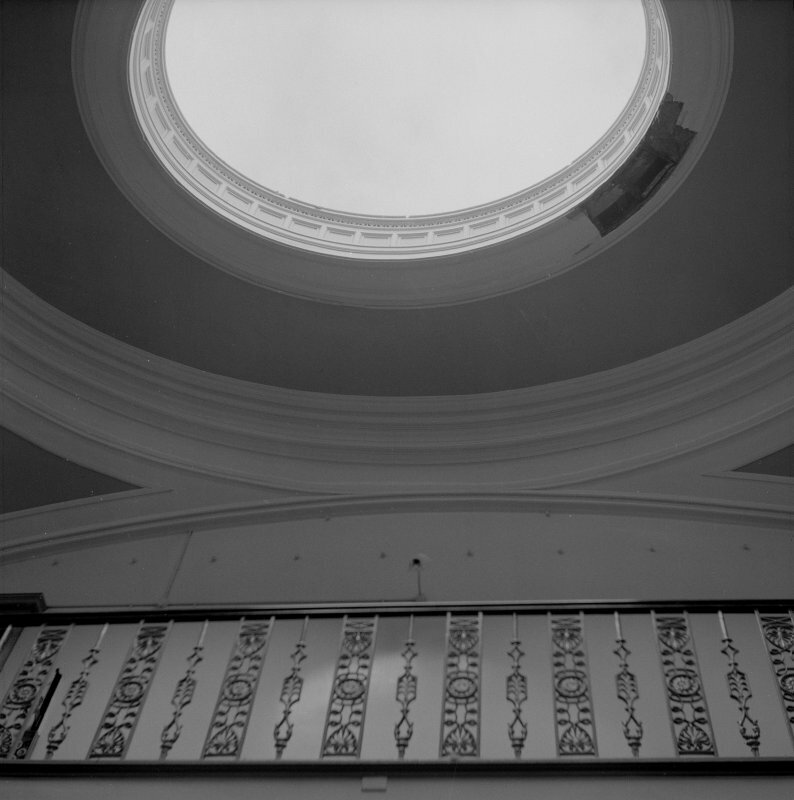 View of balustrade and dome on second floor. Castlemilk estate was the biggest property in the parish of Carmunnock. The estate, which was in the Stuart family from the 13th century, was sold to the City in 1938 for one of the huge peripheral housing estates built after 1954. Castlemilk House, which dated back to the late medieval period but had been greatly altered and extended in simple Baronial style from the 18th century, was then demolished. Converted 2006, Elder & Cannon, to offices for Housing Association. Four one-and-a-half-storey ranges around a courtyard, with octagonal Gothic tower over pend at north; currently under Lottery-funded restoration. Gothic single-arch bridge with crenellated ashlar parapets, remodelled 1833, probably David Hamilton. The Burn, known downstream in 19th-century Burnside as the Citiford, fed the reservoir of the Burnside Weaving Factory, then became the West Burn before merging with Molls Myre Burn to discharge into the Clyde as the Polmadie Burn. Castlemilk, formerly a mansion house of a branch of the Stewart family, is now used for institutional purposes. Its nucleus is a massive tower dating probably from the late 15th century. The thick, roughcast walls rise from a basement course three main storeys to a parapet, with a modernised garret above. Windows have been enlarged, and a high arched doorway inserted in the W wall (See Tranter 1962-70). Castlemilk House (Information from Matron, Children's Home) is generally as described. The remaining external features are modern, but portions within date from the 17th century. The building is in use as a Children's Home run by Glasgow Corporation. Information in letter from T C Welsh to OS 14 September 1973. A small trial excavation was undertaken to investigate the remains of the tower house and to look for a barmkin or any courtyard structures in the surrounding area in advance of the redevelopment of the site into an adventure playground. The depth of the trenches was limited by the architects requirements for the project. The excavation was carried out by Archaeology Projects Glasgow in close collaboration with the Castlemilk Local History Group. Castlemeilk House dates to the 15th century when it was built as a tower house for the Stewart family. During the 18th and 19th centuries the house was extensively rebuilt and renovated and became a large manor house with landscaped grounds and gardens. It was in this final state that the house was bought by Glasgow City Council in 1936. It was then used as a children's home until the early 1960's, after which it fell into disrepair. The main house was then demolished in 1969 leaving the centre stump of the tower house which still survives today. The initial trench situated outside the south-west corner of the tower failed to uncover any material associated with the earlier phase of the house. It appears that this whole area was severely truncated when the main house was demolished in 1969. A second small trench excavated round the north-west corner uncovered the wall of the 1851 extension but the presence here of a sub-basement rendered further investigation unnecessary within the terms of the remit. Two small trial trenches were then excavated in the interior of the toweer. These showed that any occupation levels had been bulldozed and that the surviving ground level is in fact the bottom of the original foundations. These were later strengthened after the demolition of the main tower house by a concrete apron which two sides of the tower. A further two trial trenches were excavated to the west of the tower beside the existing asphalt playground. Both of these picked up a defensive ditch, as might be expected given that the eastern approach is the least naturally defended. In the southernmost trench the ditch appears to curve round to the east. Due to lack of time and for safety reasons the ditch was not bottomed but would appear to be excess of 2.00m deep. In the northern trench the ditch had been filled with midden material which produced pottery, bone, bottle glass and a clay pipe bowl that would date the deposit to the 18th century if not earlier. A mortared stone stone structure with a dressed stone face was also uncovered running EW across the line of the ditch and has been interpreted as a possible bridge. NS 609 596 The survey area comprised the portion of the undeveloped grounds of the former Castlemilk House, including the remains of Castlemilk Tower and a possible motte. A desk-based study and field survey traced the development of the designed landscape, identifying and describing the surviving elements, and relating them to their historical context. A surprising number of minor elements have survived, including bridges, paths and drives, dams and plantations, enabling the landscape phases to be reconstructed. The survey findings were also placed within the context of the archaeology of the immediate area. Sponsor:	City of Glasgow Council Parks & Recreation.